"Causation in the Restoration of a Misapplied Trust Fund: Fundamental Norm or Red Herring?" Introduction: When a beneficiary seeks relief for misapplied trust assets, the emerging if not prevailing view amongst commentators is that he is but exercising his primary right to performance of the trust. The beneficiary is not seeking compensation for the factual detriment caused by the breach. Thus, whether the claim assumes the form of taking a common account or equitable compensation (an unfortunate misnomer in this context), the substance of the ultimate monetary award is essentially one for an ‘equitable debt’, for which issues of breach or causation – whether factual or legal – are irrelevant. The United Kingdom Supreme Court in AIB Group (UK) Plc v Mark Redler & Co, however, was not swayed by these advocacies. The Court subsumed substitutive performance and reparative compensation under a unitary principle that it considered fundamental to all remedies, namely that: ‘the basic purpose of any remedy [is] to put the beneficiary in the same position as if the breach had not occurred. It held that ‘but for’ causation applies to the accounting of misapplied trust funds. Lord Toulson dismissed arguments based on the orthodox accounting procedure as ‘fairy tales’. Lord Reed, in a more forward-looking approach, preferred to fashion remedies to reflect the characteristics of the particular obligation breached rather than its historical origin, albeit his Lordship did not explain how this was to be done. The reasoning in AIB Group has drawn considerable criticism, predictably from commentators who consider that the debt characterization self-evidently demonstrates the irrelevance of but-for causation. Unfortunately, the impasse between the UK Supreme Court and its critics is due, in great part, to the failure to address the policy justification of the orthodox position. On the one hand, the switching of the label of the claim from account to equitable compensation has confusingly misled the Supreme Court into compensatory thinking. 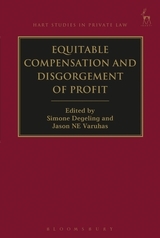 On the other hand, even if there is a grain of truth in analogizing the traditional accounting remedy with debt and specific performance, it does not prohibit fashioning equitable compensation to ameliorate any potential hardship and injustice that may be brought by a strict adherence to the analogy. The chapter seeks therefore to reinforce the underlying policy justifications of the orthodox position, and at the same time investigate possible situations where modification of the orthodox position is called for. To achieve this task, the chapter will, first, examine the historical approaches in common accounts, whereby it observes that amongst the plethora of earlier cases cited by critics of the compensation view, only a few expressly pronounce on the irrelevance of but-for causation; but, notwithstanding the dearth of direct authority on causation, it is well established that the nature of falsification is performance of the trustee’s fundamental duty to account rather than compensation. Secondly, to bolster arguments based on the nature of the remedy as debt or specific performance, the chapter will take up Lord Reed’s appeal to fashion remedies based on the justification of the duties breached; such a line of inquiry will show the orthodox position to be fully justified, at least as a default rule. The chapter will also explore situations where these underlying policies justify modifying the orthodox position. Lastly, the chapter examines how the decision in AIB Group may be reconciled with existing orthodox rules that permit beneficiaries to adopt or ratify the breaches of defaulting trustees, albeit it could also have provided the occasion for modifying the orthodox rules. Was it Lawful for the Police to Use Tear Gas on Protesters in Hong Kong? Copyright 2014. Faculty of Law, The University of Hong Kong. . Picture Window theme. Powered by Blogger.